Founded in 1902, W.E. Richards Company produced a wide range of high quality products in the Victorian, Art Deco and Modernist styles. In particular, elegant brooches, chains, bracelets, pendants, rings and expensive charms. The company used noble 925 sterling silver, gilding with 10-14-carat gold as materials. Also, cultured pearls, crystals, and semiprecious stones – agate, cat’s eye, jasper, onyx, carnelian and others. All products – labeled “Sterling”, “W.E. Richards”, “WRE” (since 1944), or “Symmetalic”, which also belongs to this company. Noteworthy, the company that has existed since 1902 is still active, but already as part of a whole conglomerate. In 1907, Richards sold his share to Raymond Horton and C.A. Howard. According to sources, in May 2003, AB group announced the purchase of W.E. Richards Company. Renaming it to W.E. Richards Company AB group, its address has changed to 40 John Williams St. Attleboro, Massachessetts. Undoubtedly, the most popular jewelry design, so beloved by women, is a butterfly along with flowers. And this choice is not casual, but subconscious, therefore women intuitively choose a butterfly design. A symbol of the soul, immortality, rebirth and resurrection, the ability to transform, a butterfly is born, transforming from a usual caterpillar. Also, the butterfly is a symbol of the Great Goddess (Great Mother, Magna Mater). The image of the Great Goddess goes back to the ancient times of human history, to the Paleolithic. This supreme deity personified heaven and earth at the same time, life and death. Hence the belief that witches can turn into butterflies. Also, butterflies contribute to conception and foreshadow war, and butterflies are the souls of the dead. In addition, in many cultures, the butterfly symbolizes the transient nature of joy. In China, this winged creature denotes immortality, leisure in abundance, joy and summer. The butterfly depicted with plum symbolizes longevity and beauty, with chrysanthemum – beauty in old age, with a feather – longevity. 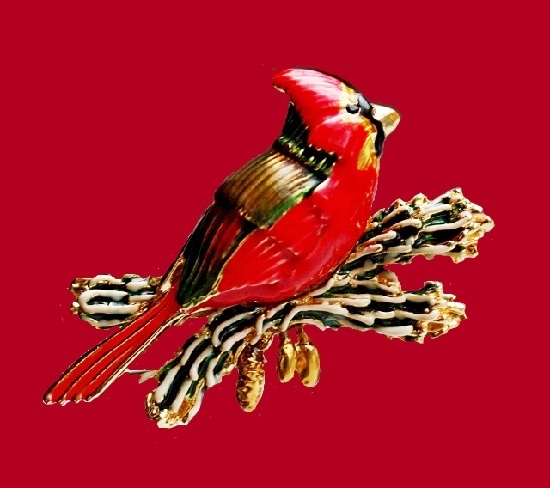 French jewelry brand Pierre Bex began producing its decorations in 1969, but closed production in late 1980s. Thus, all the products of the brand are vintage and desired for collectors and lovers of vintage jewelry. 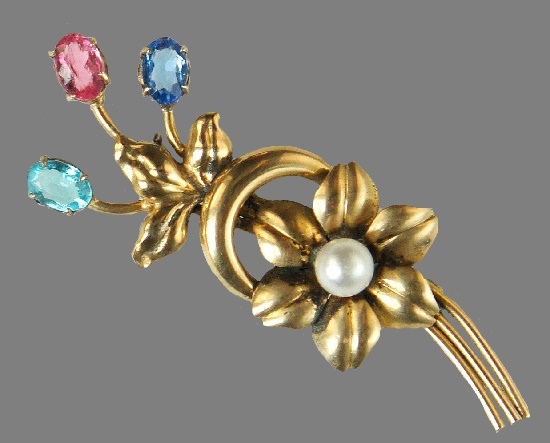 The company jewelers masterly reproduced vintage jewelry using antique clichés. Also, the Pierre Bex company manually produced unique decorations and miniature interior items. In particular, photo frames, business card trays, Art Nouveau, Art Deco and Baroque perfume bottles. Traditionally, jewelry was made of copper, covered with silver, decorated with crystals and then enameled. Produced in limited editions, the decorations were of the highest quality, and today are very popular among collectors around the world. Becks jewelery is so perfectly made that it is often difficult even for collectors to distinguish Pierre Bex items from antique ones. Noteworthy, products were rarely marked, sometimes sold with paper labels, but brooches are always recognizable by geometric patterns. Rare museum quality brooch made of jewelry alloy, gilding, enamel and rhinestone. 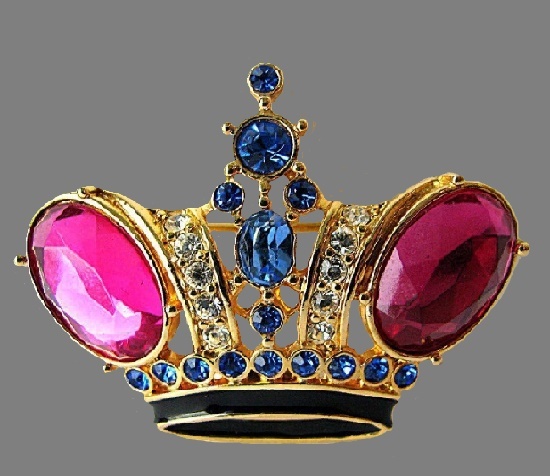 The brooch is quite large and voluminous. 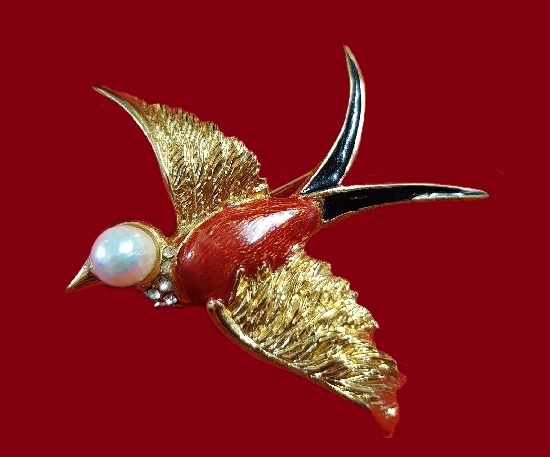 Like all the decorations of the Smithsonian Institute, created according to the works of art from the museum collections, the brooch is fine, and the bird looks very natural. Every piece released with the SMITHSONIAN marking is inspired by museum pieces. Noteworthy, the Smithsonian jewelry collection which appeared before the 1970s, boasts a wide variety of stylistic solutions inspired by priceless exhibits. Processed manually, each product is accompanied by a description of the design features, a story, and which exhibit served as the prototype of the decoration. The brand name Carven comes from the first three letters of its founder – Carmen de Tommaso and the last three letters of her aunt, Beyriven. Soon, the locals called Carmen – Madame Carven. She was the wife of industrialist Rene Grog, the family had a good income and did not need anything. Carven herself was a French woman of short stature, about one and a half meter. Accordingly, she always faced a problem of lack of clothes of the necessary size. One day she wondered if she could open her own atelier where she could help all the non-standard women of France. So, Madam Carven started her own business in 1945. In the 1950s, the number of clients increased so much that she had to expand the studio to the entire first floor of the building and hire assistants. Noteworthy, with the designer’s things, Carven house began producing costume jewelry. The glory of the atelier spread far beyond Paris. The princess herself from Egypt was a customer of Carven. Also, the regulars of the studio were the famous Michelle Morgan, Leslie Caron and Edith Piaf, who ordered both clothes and jewelry. Traditionally of high-quality, all jewelry marked Carven was hand-made with the use of gilding and imitation of precious stones. Carven Vintage brooches and earrings of abstract, animal and floral designs have become the subject of collecting vintage jewelry lovers. American jeweler Frank Gargano created jewelry in the 1940s in Providence, USA. 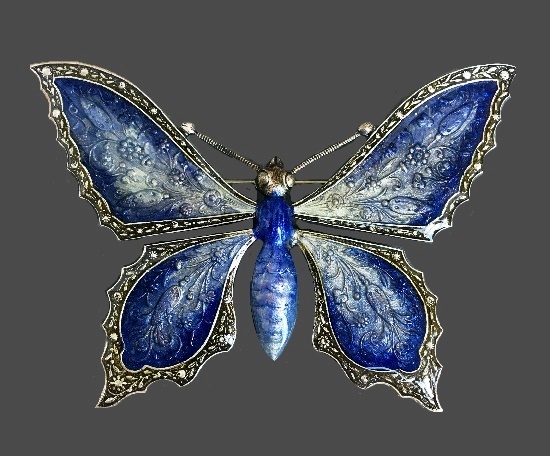 According to the Brunialty catalog (“American Costume Jewelry” by Carla Ginelly Brunialti & Roberto Brunialti), Frank Gargano patented several brooches produced between 1946 and 1947. Traditionally, collections of little brooches had a plot, for example, a boy on an elephant, a bear cub on a bicycle, also figurines and comets. Gargano marked the brooches “sterling” or “carman sterling” and added “pat”, that meant all brooches had patents. Unfortunately, we know almost nothing about Frank Gargano himself. Since the jewelry of this designer is extremely rare, it is very valuable. 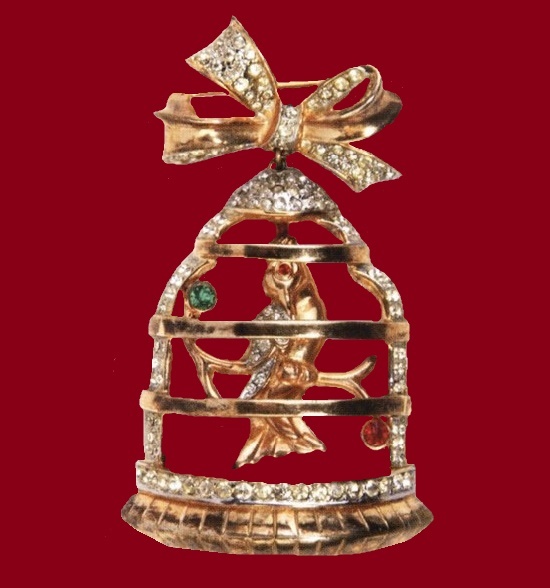 For example, an approximate price for the caged bird brooch (the above picture) can reach $500. Accordingly, there is a risk of buying a fake. Undoubtedly, jewelry work of the master, and the individual style will not leave anyone indifferent. American actress Alana Stewart, like some other Hollywood stars, has created a jewelry company under her own name. Her jewelry is always spectacular, large, beautiful design decorations of high quality. Traditionally, Alana Stewart decorations feature floral design made with the use of gold tone jewelry alloy, enamel, crystals, glass cabochons and rhinestones. 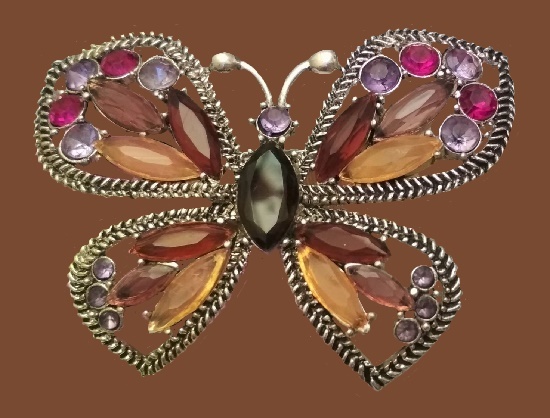 Signed Alana Stewart, costume jewelry pices in this post – vintage sets of brooches and earrings made in 1980-1990s. Hollywood star and former model, Alana Stewart (real name Alana Kaye Collins) from 1979 to 1984 was married to rock star Rod Stewart. Now, at the age of 74, she is president of the Farah Fawcett Foundation, a charitable organization against cancer. Looking at the photo of this beauty, it is hard to believe that her date of birth is May 18, 1945! Noteworthy, Alana continues to star in the series.